1. An order with the power of legislation that is declared by a ruler or another person or group that has government authority: The decrees that abolished slavery were meant to establish the foundations of a nation committed to equality for all people. 2. A ruling that is given by a court or legislature regarding legal actions: The state government sent out an official decree that any foreign immigrants who wanted to live and work in California had to have a legal passport. 1. To proclaim, to declare, or to pronounce something by an authority. 2. A statement presented by a court of law regarding a legal action. 3. 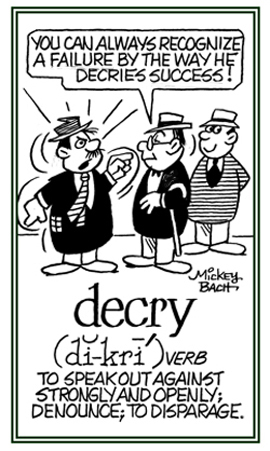 Etymology: used since 1303, from Old French decre, a variant of decret; from Latin decretum, neuter of decretus, from decernere, "to decree, to decide, to pronounce a decision"; from de-, "down" + cernere, "to separate". 1. Weakened, worn out, impaired, or broken down by old age, illness, or hard use. 2. In poor condition; especially, as a result of being old, overused, or not working efficiently. 3. 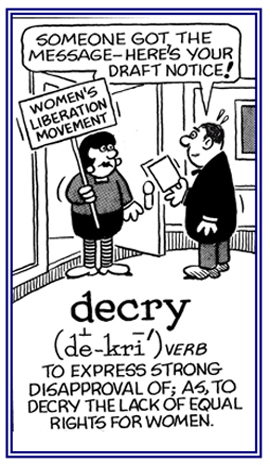 Etymology: from Middle French decrepit, from Latin decrepitus, from de-, "down" + crepitus, from crepare, "to crack, to break". 1. To heat a substance; especially, a salt, until it crackles or stops crackling, or to be heated in this way. 2. To roast or to calcine (crystals or salts) until they emit a crackling sound or until the crackling stops. 3. To make a crackling sound when roasted. 1. The crackling or breaking up of certain crystals when they are heated. 2. The sharp sound of snapping noises; such as, the crackling and the snapping of certain salts when heated. 3. The breaking up of mineral substances when exposed to heat; usually, accompanied by a crackling noise. The quality or condition of being weakened or worn out from age or wear. 1. The quality or condition of being weakened, worn out, impaired, in poor working order, or broken down by old age, illness, or hard use: Henry realized that decrepitude was creeping into his life even more at the age of 75 because he had to wear a hearing aid and stronger glasses, he needed a cane for walking, and he had uncontrollable arthritis in the joints of his elbows, fingers and knees. 2. Etymology: from Latin decrepitus (de- + crepitus from crepare, "to crack, to break" + -tude, "quality, condition of"
1. In the Roman Catholic Church, a decree; especially, a papal letter giving a decision on a point or question of canon law. 2. Etymology: Middle English, from Old French decretale, previously from Late Latin decretalis, "fixed by decree", from Latin decretum, "principle, decision". Showing page 10 out of 44 pages of 646 main-word entries or main-word-entry groups.